Feeling blue? You’re about to. Blue is one of the hottest color for 2018 when it comes to one very important space: The kitchen. And that goes for green, too. Yes, after many years of all-white everything, expect to see some deeper, moodier shades in your chef space. It’s time for a kitchen renaissance. “Expect kitchens to take on moody ocean-inspired shades,” said House Beautiful in their rundown of 2018 kitchen trends. “Blues and greens emerged as ‘go-to’ color choices for cabinetry in 2017. They are being mixed with other colors, complementing wood stains or even being used as the dominant color alone, according to Stephanie Pierce, director of design & trends at MasterBrand Cabinets,” they said. The rich blue cabinets in this kitchen draw the eye, but, then, so do the graphic tiles. 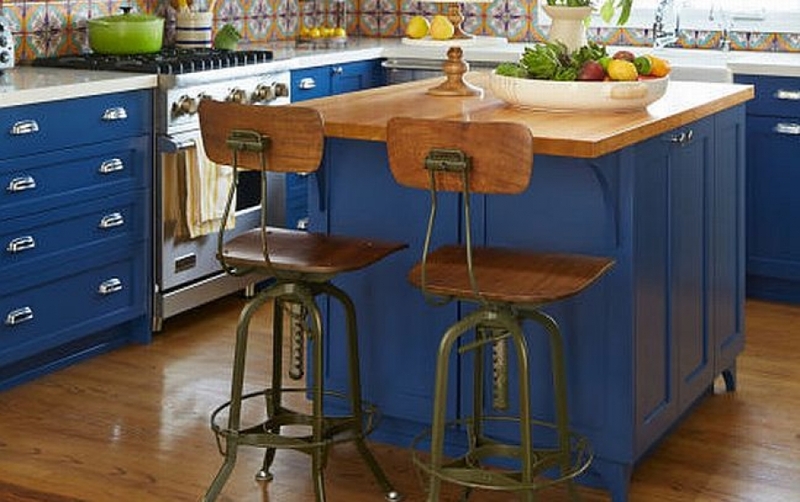 Together, they form a standout space that proves that, “a bold shade of blue doesn’t have to be intimidating, as shown in this 1920s California bungalow,” said Country Living. There’s so much going on in this kitchen, between the reflective surface on the island and the fun circle details on the floors, the shiplap-style ceiling, and the immense light fixture. 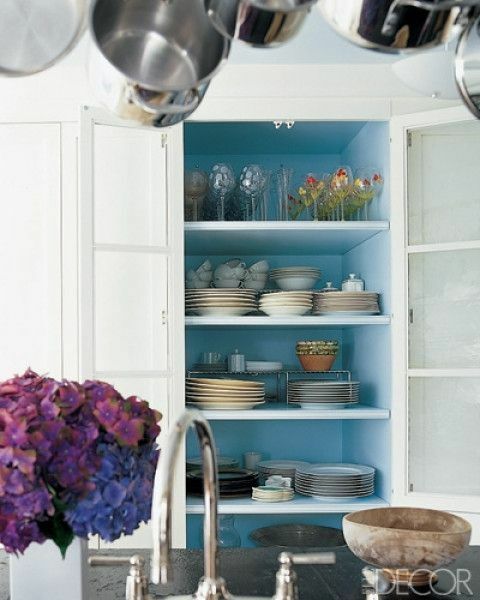 But, the blue cabinets still manage to attract attention with their cool color, clean lines, and great hardware. You don’t have to make a massive commitment to blue to bring it into your kitchen. The surprise pop of blue inside this glass-front cabinet is a way to introduce color slowly. You can also leave the cabinets a more neutral color and pick a rich blue for your range and hood for a show-stopping look. Designers and homeowners started flirting with dark green cabinets last year, and 2018 is the year the color is expected to become more widely embraced. If you’re afraid that a hue so deep will make your space feel dark or small, look at how this kitchen uses white walls and counters plus mixed metals to keep it feeling chic and open. 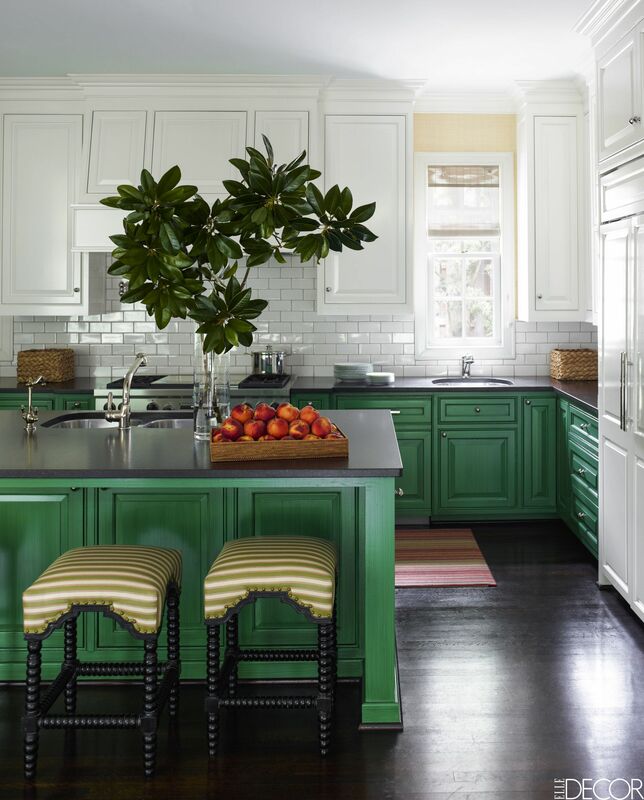 In this stunning kitchen, the green cabinets are the perfect foil for generous slabs of marble. You can also get a modern look that weaves in the green without going full blast by using a two-tone approach. This kitchen manages to bring the drama and stay light and airy thanks to the green bottom cabinets and island that ground the space, juxtaposed against the white uppers and back-splash.